Here is a unique handmade embroidered blackwork table runner decorative sampler panel. The antique handmade table runner panel features detailed black embroidery work designs in a geometric floral pattern. Other needlework techniques are cutwork openings with needle lace wheel lace patterns. The antique embroidered blackwork table runner sampler panel is beautifully finished off with a black lace edging around the 3 sides. The back is a silk fabric that shows the magenta color. Antique Embroidered Blackwork Handmade Table Runner Measurement 27 1/2" x 14 1/2". Circa: early 1900's or earlier. 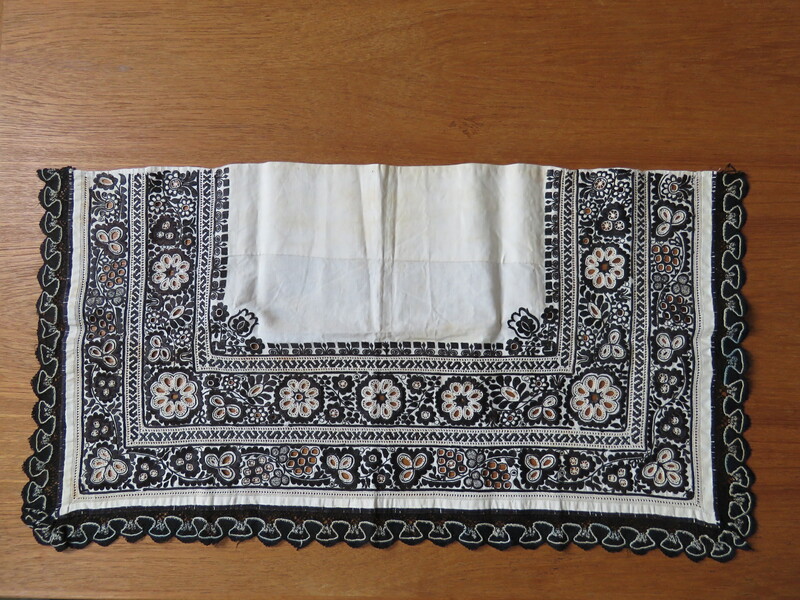 Antique Embroidered Blackwork Handmade Table Runner Sampler Panel Condition: Very good condition. A few stray threads on the black lace edging along the sides of the antique embroidered blackwork table runner panel. The magenta silk has shredded i two places on the reverse side. Slight storage scent.